The New Book of Optical Illusions is a mind-bending collection of 150 of the most significant optical phenomena, loosely grouped into 33 chapters according to particular visual effect. An optical illusion has two elements. One is the perceived illusion, what you see. It may be merging lines, moving shapes or conflicting sizes. The other element is the scientific explanation or neuronal basis of the illusion. Here enters The New Book of Optical Illusions, which describes the latter - the science of an optical illusion. 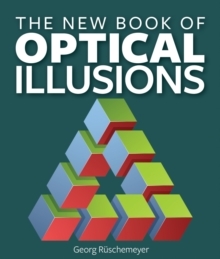 Concise text describes the history of the optical illusions and their origin. Some are ancient (like a 3D Roman mosaic in a 2nd-century BC home on Malta) and others are modern (like emoticons and street art). There are rarely seen phenomena, works by great illusionists, like M.C. Escher, and well-known illusions like the Impossible Triangle and the Albert Einstein/Marilyn Monroe portrait. Some of the illusions are: Seeing Things That Are Not There - Discovered on a BBC studio wall in the 1950s, this illusion involves shadows that seem to flit up and down along columns of stripes. Apparently the number of identical lines causes the brain to lose proper focus on what it is seeing. Flashes from the Corner of the Eye - The Scintillating Grid is a variation of the classic Hermann Grid first described in 1870. In this illusion, circles in an intersecting grid disappear and reappear elsewhere. It is a complex effect rooted in lateral inhibition, which increases the contrast between light and dark in the retina. Perfect for young and adult readers and enthusiasts of optical illusions, this is a great selection for circulating collections and retail customers.